While total volume in single name stocks and especially ETFs soared yesterday exploded amid the broad hedge fund and systematic selloff, a different picture emerges when trying to measure how one-sided the bearishness of yesterday's action was. 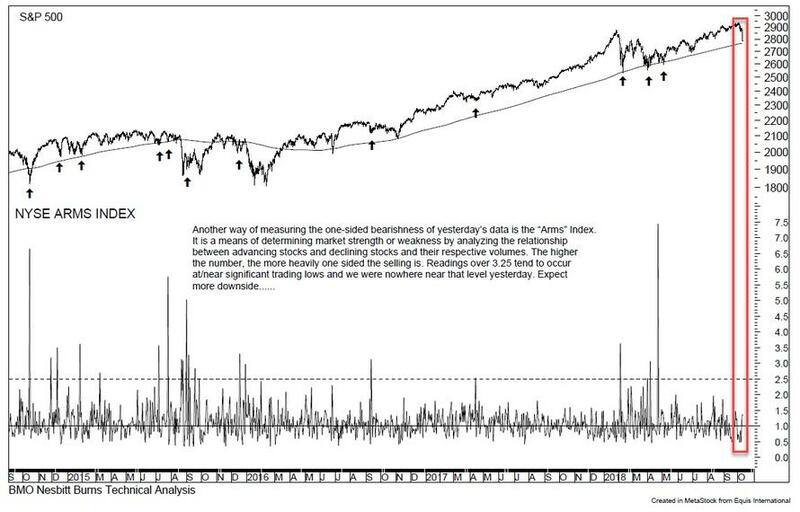 As BMO technical analyst Russ Visch writes in his morning note, a better way of visualizing the selling pressure yesterday is through the NYSE "ARMS" index, which is a means of determining market strength or weakness by analyzing the relationship between advancing stocks and declining stocks and their respective volumes. And, according to Visch, "the higher the number, the more heavily one sided the selling is." Specifically, readings over 3.25 tend to occur at/near significant trading lows.... and as shown in the chart below, "we were nowhere near that level yesterday." In other words, there was no selling panic, and no legitimate liquidation as the selloff was largely a function of coordinated deleveraging by both hedge funds and systematic traders. Which brings us to Visch's simple conclusion: "Expect more downside."